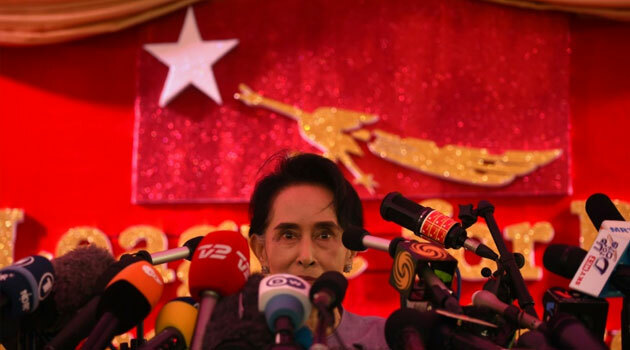 YANGON, Myanmar, Nov 10 – A senior member of Myanmar’s ruling party said Tuesday they had “lost completely” to Aung San Suu Kyi’s opposition, as a major election win for her democracy movement appeared within touching distance. The drip feed of poll results pointed to a big win for her National League for Democracy (NLD), which has bagged 49 of the first 54 lower house seats announced so far. The ruling Union Solidarity and Development Party (USDP) was braced for a rout after taking just three of the declared seats, with many party heavyweights losing. “Our USDP lost completely. The NLD has won,” senior party member Kyi Win told AFP from party headquarters in the capital Naypyidaw. Kyi Win, a retired army officer who sits at the heart of party operations in the capital, said the NLD was poised to win a coveted majority in parliament. But official victory for the NLD remained elusive, with election officials releasing results at just a trickle throughout Tuesday. The NLD needs 67 percent of contested seats for that majority. Anything higher would bolster its political leverage in a legislature where 25 percent of seats are ring-fenced for the army. Suu Kyi’s political ascent is also capped by the army-scripted constitution that bars anyone with foreign children from the presidency. Her two sons, much of whose upbringing she missed under house arrest in Yangon, are British. A massive majority would strengthen her hand in selecting a favourable president, and she vowed before the election to be “above the president” in the event of an NLD win. NLD voters believe an election win will reset the country under Suu Kyi’s guidance, in a major stride away from army control. They remained confident of a major win, but cautious of kickback from the powerful army. “I think the results will come soon, but I’m worried,” said Ma Pyone, a vegetable seller in downtown Yangon. The NLD recorded a landslide in the last elections it contested in 1990 only for the army to ignore the result and double down on its repressive rule. But in a televised statement before Sunday’s election President Thein Sein said both the ruling party and the army will respect the result. Buoyant red-clad supporters of Suu Kyi’s NLD sang and danced for a second night on Monday outside the party base in Yangon, cheering each confirmed win as expectations of a landslide mounted. But on Tuesday morning the big screen and loudspeakers, which 24 hours earlier carried an impromptu address by Suu Kyi, were suddenly removed. Washington welcomed the “peaceful and historic” election but nonetheless urged caution until official results were announced. Election officials have estimated an 80 percent turnout, a figure observers say will aid the NLD’s quest for a majority, but it could take days for the full results to be officially announced.